These two mature caterpillars of Leptotes pirithous were discovered on a Plumbago capensis bush (Toulon - France - August 2010). Their size indicated that they were about to pupate, so they were picked up and reared separately in special cages. 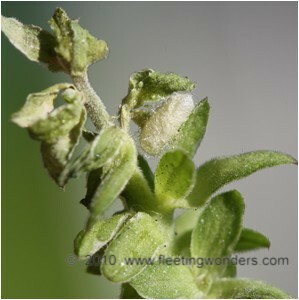 The aim of this operation was to possibly observe the whole process of the nymphal molting and to see the pupa of this Lycaenid. Several days later, one of the two caterpillars was found dead. Its shrivelled body showed a minute hole. 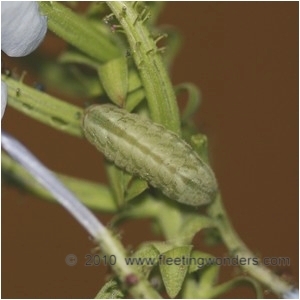 When looking at the Plumbago branch which had been put inside the cage, my attention was attracted to a small yellow silken cocoon, which was fixed to a leaf... the conclusion was that unfortunately, this caterpillar was parasitized by a solitary parasitoid wasp. Three weeks later, small wasps exited the cocoons. 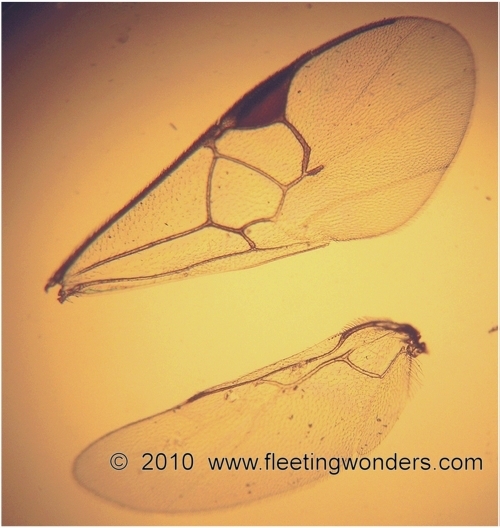 The number of articles of the antennae and the venation of the wings allow to recognize a braconid wasp (Braconidae family). 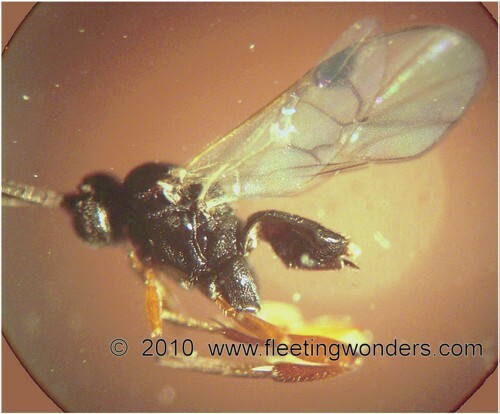 The examination of those wasps by sir Mark SHAW, a specialist from the National Museums of Scotland, lead to the identification of Cotesia inducta (Papp). 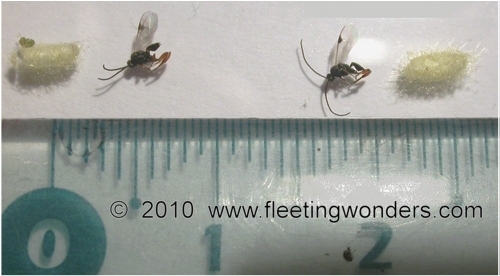 This wasp parasitizes other lycaenids in Southern Europe and was recently found in Great Britain (2006) and Ireland (2005), where it parasitizes Satyrium w-album and Celastrina argiolus. According to specialists, this species was not recorded before 2005 despite careful researches and is now very commonly found, which suggests that its arrival in Great Britain occured recently. 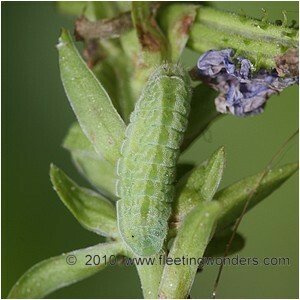 The green lycaenid caterpillars shown above are easy to find on Plumbago capensis in the district of Toulon; although they are very often parasitized by Cotesia inducta, I managed to rear some unaffected ones until the emergence of the butterfly, which brought a proof that they are of Leptotes pirithous. 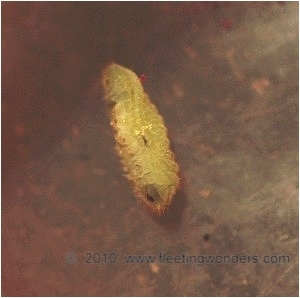 The life cycle of Cotesia inducta really is amazing, since a caterpillar of small size is parasitized by a single wasp larva. Given its small size, the host probably could not bear much more parasites... (it would lead to the early death of the host and would not allow the wasp to achieve its cycle). 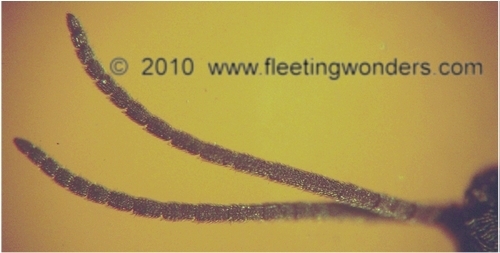 In wasp species that parasitize caterpillars of larger size, the number of grubs is much higher and sometimes polyembryony occurs (i.e. a single egg is injected by the wasp within the host but the original embryo divides several times, which gives many genetically identical copies of the primary embryo).